Hey, just so you know ... this post is now about 6 years and 11 months old. Please keep that in mind as it very well may contain broken links and/or outdated information. Apparently I have a thing for doing homebrew stuff in April: almost exactly two years after softmodding my Wii so I could load my games from a USB hard drive instead of discs, I found myself wondering if I could do the same for Virtual Console and WiiWare content. Well, of course you can! The path can be confusing and frustrating, but the destination … well, it’s a cool destination. 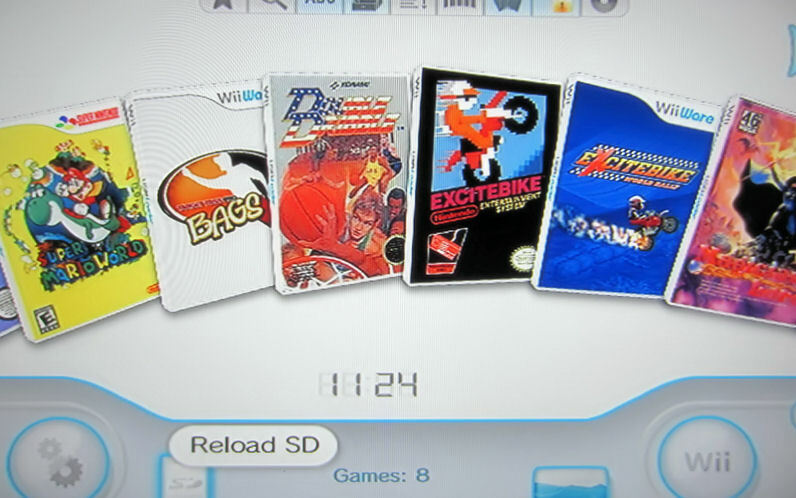 I’ve been very happy with my USBLoader GX setup, but it occurred to me that since my Wii always boots directly into the loader (thanks to Priiloader), I was neglecting my VC and WiiWare games! A quick Google search later and I found this WiiHacks guide for creating ISO forwarders to run that content like a disc-based game. While the guide itself is very clear and detailed, it still took me a few hours to wrap my head around the process and get everything functional. In addition to the WBFS partition on my USB hard drive that contains all of my games, I had an exFAT partition created by Windows 7 that I was using for extra storage. I had to reformat that as FAT32 (using EASEUS Partition Manager) in order for the extracted NAND folders to be accessible to the Wii. I also had to put the NandGames folder on the root of my SD card (instead of the hard drive), otherwise I kept getting the “Loader.dol not found” error when trying to launch a VC/WW title. I also ran into the SD card lock switch problem again. With all the back-and-forth I was doing moving the SD card between the Wii and my PC, the lock switch moved ever so slightly down. It wasn’t enough to make the SD card read-only on my PC (which is why I didn’t notice at first) but it was enough to cause strange problems with certain homebrew apps like the d2x cIOS Installer to freeze. I thought I had really screwed something up until I happened to notice the lock switch and that solved the problem. After all of that, though, check it out! Just having the game icons in the loader doesn’t mean they will actually run, however, so next I had to test each one. Only two of my games didn’t work right away: Magician Lord and Target Toss Pro: Bags. Magician Lord, my only Neo-Geo VC game, would load but not show any video. The game was still running, I could hear the background music and even start and “play” the game, I just couldn’t see anything. If I pressed the Home button on my Wii remote, the video would appear behind the Wii system buttons. The issue turned out to be the need for interlaced mode. Following the instructions, I pressed Z+A+2 while in the Operations Guide for the game and that fixed it! But getting Bags to work is when the rabbit hole appeared … and I fell in. After hours of messing around with different IOS base version and slot combinations, loader settings, and reading forum threads, I could not (and still can’t) get this game to run from the extracted NAND through the loader. I’d get the health and safety screen, and then the Incredible Technologies and N-Space “loading” screens, and then just a black screen and the Wii would hang. I even tried Mighty Channels and Triiforce, but the game wouldn’t work through those either. It didn’t help that Bags is apparently not a very popular WiiWare title: I could only find one mention of it with regards to running through a loader with no details. Finally I just gave up before I screwed up the other 99.9% of my games that do work. If anyone has gotten this game to work through a loader with an ISO forwarder, please drop me a line in the comments! Update: I got it working! It took two sleepless nights but I finally have it working! I too had to place the “NandGames” folder in the root of my SD card for everything to work properly but the end result is excellent. Thanks! Where do the large files reside? I assume the ISO is a small file and the NAND folder on your SD card is huge? The ISOs are the disc images, which are large (gigabytes) and stored on my external hard drive. The NandGames folder on my 512mb SD card just contains a 681k loader.dol file. All of the other stuff on the SD card (homebrew, config files, etc.) takes up about 230mb. Hi, where do I get the loader.dol file? After turning these options on, I was able to see all my Virtual Console games in the loader … and the one for Bags (Target Toss Pro) worked! 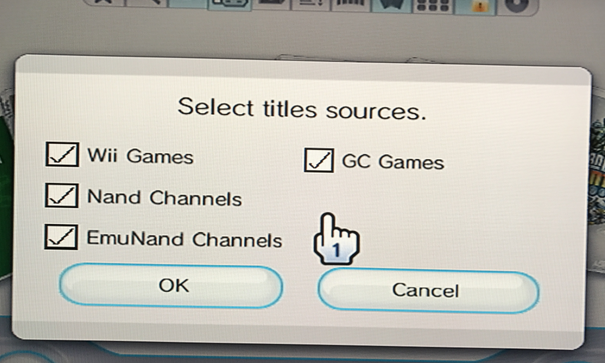 Since I had already added my VC games to the loader back in 2012 as part of this post, I had to hide the duplicates but now I can launch Bags and channels (like the Mii Channel) directly from the loader. Nice!